As it curves around the head of Gruinard Bay, the A832 is coming to the end of its long, cross-country journey. True, there are another 20-odd miles to go, but this is the final leg. After crossing the Gruinard River, the road, turns sharply to follow the river through woodland to the shore, and pass Gruinard House. Just after passing the jetty beside the house, there are glimpses over to Gruinard Island. This island became well known after it was used to test anthrax as a biological weapon during the Second World War. The 1942 test was sanctioned amid fears the Germans might attack the UK with biological or chemical weapons, and after it was released on the island, a flock of sheep was wiped out. The island was so contaminated that it was deemed out-of-bounds for almost 50 years. In 1986, it cost half a million pounds to decontaminate the 520-acre island. To prove that the clean-up was successful a flock of sheep was allowed to graze the island at the behest of an independent watchdog set up by the Ministry of Defence. Finally, in 1990, Gruinard was finally declared safe again. Leaving the coast for a while, the road deteriorates a little in quality as it climbs up eastwards towards the woodland at the top of the 585-foot Druim nam Fuath. Following Allt Mhungasdail (the Mungasdale Brook), this is a gentle interlude before what may be some of the grandest scenery that Britain has to offer. There is a car park from where there are some truly superb views of Little Loch Broom and the mountains beyond. The road then slowly descends through the small settlements of Badcaul and Badbea, where it joins the southern bank of Little Loch Broom. Again, there are some tremendous views on this stretch of road, with the old passing places now being used as lay-bys. The views of the loch, Sail Mhor and the peaks of An Teallach make this a road to savour. Running east along the loch, we pass the Ardessie Falls and Camusnagaul to reach the end of the loch at Dundonnell. Just after the Dundonnell Hotel, there is a little car park. This is the the place to stop if you wish to walk up towards the hills of An Teallach. An Teallach is a strong contender for the title of Britain's best mountain. As with Liathach, the mountain is composed of sandstone, and different weathering rates produces a ridge of pinnacles that mountaineers love. An Teallach has two Munros, and is also situated near the coast which enhances the views on clear days. This, however, also means that the mountain takes the full force of Atlantic storms. Despite the coastal location, the mountain rises to nearly 3500ft and, this far north, snow can fall at any time of the year. It is worth stopping here just to see the tiny loch of 'Toll an Lochain', which is about 2000 feet above sea level and situated underneath the great cliffs of Sgurr Fiona. A word of warning though! The inexperienced should be careful though as there have been fatalities on the mountain, particularly in descents. Many climbers just visit Bidean a Ghlas Thuill (the summit) and Sgurr Fiona, and thus miss out the harder parts of the mountain. The Dundonnell Mountain Rescue Team cover this area, and in an emergency, they can be called out through the police. Use the normal emergency numbers, 999 or 112, rather than calling the team directly though. At the head of the loch, the road enters Strath Beag and starts a gentle climb along the bank of the Dundonnell River. After passing Dundonnell House, the road starts to climb more steeply again, passing through a stretch of heavily wooded land, and after passing another waterfall, the road runs through the rocky Dundonnell Gorge. Still climbing, the scenery opens out on your left hand side, while remaining thickly wooded on your right. Passing waterfalls every mile or so, the road is of a surprisingly good quality on this section despite all the bends. The river is crossed as the glen starts to open out a little, and then as the road crosses the 1110-foot Fain Summit, there are more great views of the surrounding hills. Drifting downhill towards Braemore, the scenery is the usual mix of moorland and scrubby woods but there is one last surprise in store. The Corrieshalloch Gorge National Nature Reserve fills the hollow between the A832 and the A835, just before Braemore Junction. This spectacular mile-long gorge is 200 feet deep, and is one of the finest examples in Britain of a box canyon. The river which carved this channel through hard rock plunges 150 feet over the Falls of Measach. The suspension bridge, a little way downstream from the falls, was built by John Fowler (1817-98), who also designed the Forth Bridge. Further downstream, a viewing platform provides an excellent viewpoint looking up towards the waterfall. Just after the gorge, the A832 finally reaches its terminus of Braemore Junction. Here you used to have the extraordinary sign facing you of Ullapool A835 to the left, and Inverness Wick A835 A832 to the right. I'd still love to know why the A832 was not in brackets on that sign! As remarked earlier, it is, however, only 19 miles, from here to Gorstan, if one takes the A835, rather than the 88 miles via Gairloch! That sign is shown here. Somewhat sadly, it has been replaced by a rather more straightforward sign that just says Inbhir Nis/ Inverness A835 (A9). This is the fourth and last time that the A832 and A835 meet, and perhaps the most dramatic junction of them all, with the tantalising proximity of the Corrieshalloch Gorge. Overall, despite the sinuous nature of much of this road, it is, without a doubt, one of the finest in Britain. If you get the chance, it is well worth a trip, either driving or cycling. This section of road was part of the B859 when the roads were first classified in 1922, the A832 originally terminating in Poolewe. 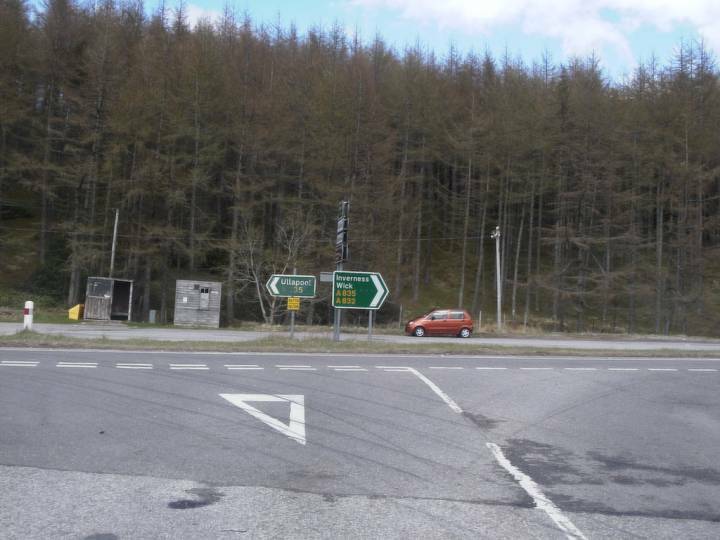 However, this was soon changed with the A832 extended to its current terminus at Braemore. The road, however, has seen the least changes to any section of the A832 over the last 90-odd years. a number of bends have been realigned, a few bridges replaced, with the necessary adjustments to the road line, and the road has been widened too. The longest sections of old road that have been abandoned are either side of the summit at Fain, others can be identified by the laybys and driveways to houses here and there. The final bridge and junction at Braemore have also been moved a little upstream. Otherwise, there is surprisingly little for the explorer to find on the last section of this road. This page was last modified on 11 February 2018, at 22:24.